Some of the biggest challenges families face are managing stress and maintaining a healthy and balanced lifestyle. We as parents may think we have a monopoly on stress, what with our busy days, deadlines at work, housework at home…but kids experience just as much stress as we do. In fact, modern kids are experiencing more stress and and anxiety than we give them credit for, and they try to distance themselves from it in the same way we adults might; by losing themselves in video games and TV shows, by retreating from social interaction to an extreme degree, and in severe cases through self-harm or the abuse of alcohol or drugs. 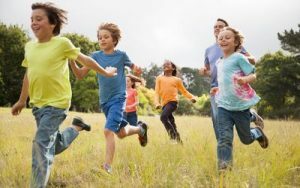 There may not be any particular miracle cure to relieve kids of stress and anxiety, but there are three simple and absolutely free ways to help you AND your kids stay balanced and healthy. 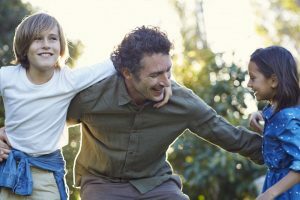 These aren’t based on the most current research (although current research does confirm their benefits,) rather, these are the three things you will remember as the best and most memorable moments from your childhood, and which your parents and grandparents will remember as the best and most memorable moments from their childhoods. These are the things we instinctively long for, and yet they are so easy and ever-present that we take them for granted and end up neglecting them. We suffer as a result. Our children suffer as well. With more kids every year being diagnosed with depression, diabetes, and social anxiety it’s clear that we need to, in some fundamental ways, go back to our roots. Keeping these three simple priorities can help you AND your kids live healthy, balanced lives.